Girl meats Paleo: Are you snowed in tonight? Join me in the Frozen Apple. Are you snowed in tonight? Join me in the Frozen Apple. It is very late here in Manhattan and so my sweet schoolteacher hub is fast asleep but I am gazing out at the white haze that is "Winter Storm Hercules." So far it isn't too bad. Although i'd like to share one of this city's many oddities: The Governor of NY has declared a State of Emergency due to the weather. 3 highways in the area have been closed due to hazardous travel AND YET: school is still in session! Our new mayor has told the citizens to stay inside during the storm but he wants teachers and students on their way tomorrow morning at 6am. Logical, right??? I'm hoping for a last minute dump of snow in the early morning so that maybe J will be allowed to stay home and play in the flurries with me. Snow in the city is a Godsend after all, everything is quieter and lovely. I'm looking forward to a long walk in Fort Tryon Park tomorrow to really enjoy the scenery. If you are ever on the island of Manhattan I suggest taking a stroll in this park that is often forgotten in comparison to the more centrally located (is that where they got the name?) Central Park. Tryon is much lovelier with grand views of the Hudson River and tons of small winding paths to follow. ALSO, if you're ever in Manhattan check out HU KITCHEN. 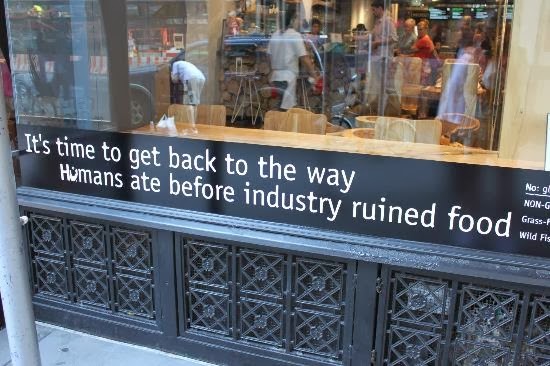 New York City's 1st PALEO RESTAURANT!!!!!!!!!! Hu's team does a great job of really following Paleo food values. They even make their own almond milk so you won't find dairy or even carageenan anywhere. Their enchiladas are fantastic and they've got a great Thursday night Happy Hour with some pretty awesome beverages on tap including blackberry kombucha, which I have yet to try. It is pricey but the quality is there. If you need to eat clean and don't have time to prepare a meal then Hu Kitchen will keep you on the right path. I'm really proud of what co-owner Jordan (great guy, super fun to tweet at so give it a try) has done with this place and look forward to their growth both in popularity and in expanding their hot menu offerings. Hu's success is a great sign that Paleo is becoming mainstream and we are going to make true and effective change to the health of so many. Brunch of 2 organic eggs with 2 pieces of uncured bacon plus half a cup of coffee with some grassfed milk. Another organic orange and some dark chocolate.